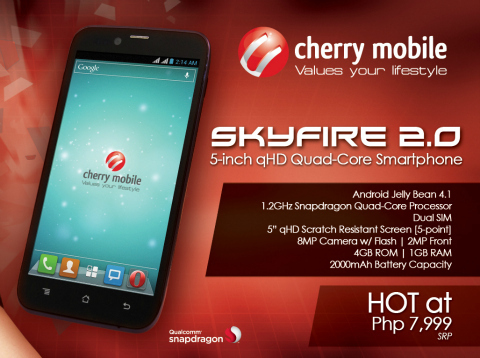 So here it goes, the Cherry Mobile SkyFire 2.0 is now official with a price tag of Php 7,999! And just like what the blogosphere has been predicting, the new Cherry quad-core device throws in a 5-inch qHD (960x540p) scratch-resistant display. The processor, being its flagship feature, will sport a faster 1.2GHz quad-core Snapdragon S4 processor. Other essential features include a gigabyte of RAM for smooth multitasking, 8GB rear camera (2MP front facing), 4GB internal memory, 2000 mAh battery and Android 4.1 Jelly Bean. In comparison to the MyPhone A919i Duo, the SkyFire 2.0 is quite short in the display department. The previous has a stunning IPS screen (294 ppi) while the SkyFire 2.0 finishes with 220 ppi in pixel density. However, the A919i Duo is priced with almost two grand higher than the SkyFire sequel. Both devices deserve a second look if you're in the market for a better value-for-money phone. But if you think you'll go for the Cherry brand, you can get the SkyFire 2.0 starting next week at CM kiosks or official dealers nationwide.